This paper studies the birth of the market for Japanese black tea, its decline, and its rebirth. Currently, the black tea consumed in Japan is mostly imported. But the production of Japanese black tea has gradually increased, and more than 200 tons was produced in 2016. We investigate the history of Japanese black tea, the use of manufacturing technology, and the components of tea and their effects on humans to influence quality. We found the main reasons for the revival and spread of Japanese black tea were production and manufacturing innovation. Fermentation was especially an important process because it determined tea quality. Manufacturing technology for fermentation was established by entrepreneurial farmers and transferred to other Japanese black tea farmers, resulting in the rapid market creation of the Japanese black tea. This paper discusses the development of the market for Japanese black tea products. Recently, the tea market in Japan has been divided into two tea products, imported black tea and Japanese green tea. When the green tea market shrank, some of the green tea farmers struggled and changed their unfortunate circumstances to positive ones. The entrepreneurial farmers created a third market, the Japanese black tea market. Actually, this is not a “new” market. At one time, Japan exported more than 5000 tons of their original black tea, but this market decreased and finally disappeared. Currently, the black tea consumed in Japan is mostly imported. However, there has been a renewed interest in Japanese black tea. Although most of the products were of poor quality at the beginning, the quality has drastically improved over the past few years, and the market has increased. Most of the Japanese black tea has been consumed as leaf tea and tea bag. This paper studies the birth of the market for Japanese black tea, its decline, and its rebirth. We examine the development of the Japanese black tea market considering production technologies, ingredients, varieties, and production areas. As a case, we feature tea farmers in Sashima, a major tea farm area in Japan. They produce one of the highest-quality Japanese black tea in Japan. With the case, we study why and what kind of tea farmers started producing black tea in this area. Also, how they learned the production technologies is studied. Furthermore, we consider the development of the market for Japanese black tea as a case of new market development in the food industry. Business managers and entrepreneurs often seek to engage in new market development, and obviously, they are aware of the many risks involved in such a task. Market creators try to comprehensively analyze the circumstances and determine their next step. However, there have been very few academic articles for such managers and entrepreneurs to refer to. This research aims to provide new knowledge and frameworks, for the food industry under the circumstances of diversifying consumer needs. Many executives clearly recognize the importance of radical innovation for their business. On the other hand, to maintain their own existing business, improving customer satisfaction and engaging in incremental innovation are the focus of current management practices (O’Connor and Rice 2013). Ironically, these activities are also well known as barriers for radical innovation (Sethi and Iqbal 2008). Organizations that use a mix of two management styles are called “ambidextrous” organizations and have recently received more attention (O’Reilly and Tushman 2004). These organizations aim to combine exploration management, which pursues radical innovation, with exploitation management, which seeks to make the current business more efficient (Raisch et al. 2009). This study considers whether there are similarities between new and existing businesses; a new business lacks experience, and generally, its approach is not defined. In fact, many studies have concluded that managers who are responsible for existing businesses are not good at exploring new businesses, particularly in regard to designing a new supply chain and acquiring various sales channels (March 1991; O’Reilly and Tushman 2004). Therefore, when considering both new and existing businesses, the exploration of new businesses should receive more attention. These activities are uncertain and highly unpredictable, and learning-oriented and discovery-driven processes are required (Lester and Piore 2004; Lynn et al. 1996; McGrath and MacMillan 1995; Rice et al. 2008). According to previous studies on opportunity creation theories, the opportunities for creating new markets are generally found by internal entrepreneurs rather than arising from gradual changes in existing markets (Alvarez and Barney 2007: Baker and Nelson 2005). Entrepreneurs do not wait for external changes but take action based on their internal resources. However, new technological discoveries and the networks of entrepreneurs can become triggers for their next action. After taking action, entrepreneurs carefully observe the market and consider the possible reactions. Because there is a very complicated relationship between their behaviors and results (Cheng and Van de Ven 1996), entrepreneurs use learning-based project management approaches from the beginning (Eisenhardt and Martin 2000). O’Connor and Rice (2013) argue that economic opportunities can be found through communications with customers and suppliers as well as business partners and group members. However, the signals regarding these opportunities are generally weak. The process of creating a new market includes the accumulation of diverse and subtle events and activities. However, it is extremely difficult to accurately interpret the results of preliminary efforts, and because the market size is small, it is sometimes misunderstood. In addition, decisions must be made in these uncertain situations (Hayward et al. 2006). A diversity in knowledge is required for technological application and test marketing because activities related to new business and new market creation have high uncertainty (Geroski 2003; Lynn et al. 1996). Almost all of the farmers of Japanese black tea discussed in this paper also make a living as green tea farmers. They constructed their own supply chain based on the existing green tea business. Under such circumstances, they focused on Japanese black tea, and they recovered dying Japanese black tea varieties and developed new production technologies. However, the supply chains for both Japanese green tea and imported black tea, which are the two major tea markets in Japan, differ greatly, and the two major markets are deeply rooted in culture. As a result, Japanese black tea farmers have focused on creating new supply chains and new customers. 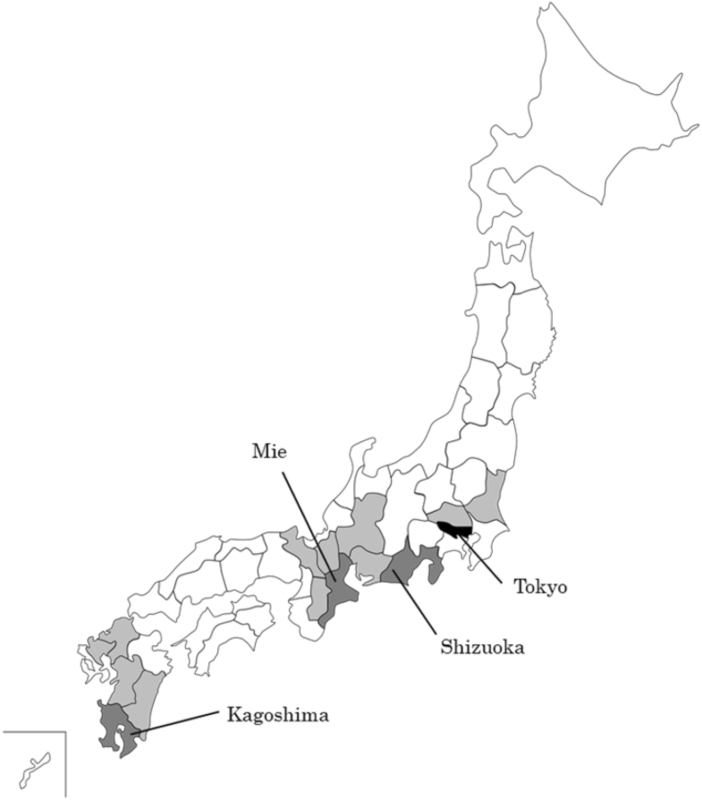 In Japan, there are a few major areas where Japanese green tea is harvested, including Shizuoka, Kagoshima, and Mie (Fig. 1). These areas almost entirely overlap the major areas of Japanese black tea production (Arai and Nagata 2017). The birth of the Japanese black tea industry occurred in the nineteenth century. The Japanese government encouraged tea manufacturers to engage in foreign trade and promoted the black tea industry (Shimizu 2010). The quantity of black tea was increased by this policy, but the quality of black tea did not improve. Therefore, the government sought to increase the quality by finding a match for the Japanese climate. The National Institute of Vegetables and Tea Science was founded to research tea plants collected from around the world for breed improvement. After successfully cultivating Assam (Indian) tea at Kagoshima, new cultivars have been developed by artificially crossing this and Chinese tea (Saito 1987). Consequently, in 1951, Japanese black tea obtained a reputation equal to or higher than that of other countries in the London market. Moreover, the export of black tea reached its highest recorded levels in 1954 since World War II. Fourteen new plants were registered as superior varieties by the Ministry of Agriculture and Forestry in 1963 (Omori et al. 2017). As domestic production and export were roughly the same in the early 1950s, it was important to export almost all of the black tea products to enhance foreign exchange. At that time, the increasing prices of Brazilian coffee caused a “tea boom” in the USA and the price of exported tea was three times higher than before. However, tea fields in other countries also expanded, and in the international market, black tea from other countries was cheaper and had better quality. Therefore, Japan’s black tea exports decreased. 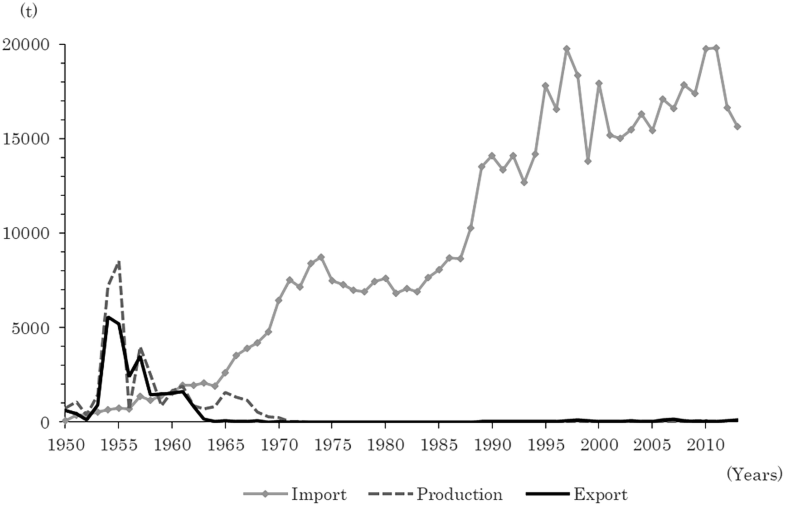 As the economy grew rapidly, the cost of Japanese black tea production increased due to labor shortages and low productivity (Zen and Kocha 1977). In addition, other major black tea production countries such as India and Sri Lanka produced higher-quality black tea than Japanese black tea. Ultimately, Japanese black tea lost its competitiveness (Zen and Kocha 1977). Since the Japanese government instituted some policies such as restricting imports of foreign tea during the 1960s, these policies gradually lost the farmers’ effectiveness. After that, due to the strong demands of other countries for expanding tea imports, the tea import was increased. Black tea production costs continued to increase with the high economic growth that began in the 1960s. Finally, the import liberalization of tea began in 1970. The Japanese yen gaining strength on the foreign exchange market, which caused exporting to have fewer advantages. After this, it became rare to produce Japanese black tea. Almost all of the domestic consumption of black tea depended on imports. As Fig. 2 indicates, imports expanded rapidly from 1964 to 1974. This affected the use of tea bags, which accounted for 65% of total domestic consumption (Nihon 2003). Although black tea consumption decreased due to an increase in coffee consumption, tea imports remained level until 1987. Imported black tea sold in plastic bottles was released by a major domestic company in 1986; the market for black tea beverages expanded rapidly, and black tea imports increased again because it was used for manufacturing these new products. The black tea imports reached nearly 20,000 tons in 1997, which was the first tea boom in Japan. At the end of the twentieth century, black tea production in Japan almost stopped. However, it revived again around 2002. The influence of the second black tea boom in Japan after 1996 and the restoration of Japanese black tea production were the main triggers for the revival of the industry. Consumers in the second black tea boom requested and enjoyed a lot of varieties of black tea including imported ones, which was also a good opportunity for the revival of Japanese black tea (Nihon 2003). The production of black tea gradually increased to 84 tons in 2010 (Fig. 3). In 2016, more than 200 tons was produced for local consumption. Under these circumstances, some Japanese black tea products were acknowledged by other countries; for example, the tea produced by Satsuma Eikokukan in Kagoshima won a gold medal in the Great Taste Awards in the UK. Tea is made from the leaves of Camellia sinensis (Camellia sinensis (L.) O. Kuntze), which is an evergreen of the family Theaceae. There are two main varieties: Assam, which is Indian (C. sinensis var. sinensis), and Chinese (C. sinensis var. assamica). It is generally said that Assam is suitable for black tea and Chinese tea is suitable for green tea, because Assam has more polyphenol oxidase and is easier to ferment due to its wider leaves. In general, Assam tea is cultivated mainly in Indonesia, Sri Lanka, Africa, and other places with high temperatures and humidity. Chinese tea is cultivated mainly in China, Japan, Taiwan, and other areas that produce green tea. Because Japan is in a temperate zone, it is difficult to cultivate Assam tea. Japanese farmers improved breeding by mixing Assam tea and Chinese tea for a half century (Omori et al. 2017). However, as mentioned earlier, the consumption of green tea is high in Japan; therefore, growers focus on Chinese species suitable for green tea. Currently, “Yabukita” (Chinese tea) is the most cultivated species and represents roughly 75% of tea production in Japan. In general, tea includes tannins (catechins), caffeine, and theanine (a type of free amino acid). Tannin is astringent, and caffeine has a bitter flavor; these are two types of polyphenols (a generic term for components having large multiples of phenolic hydroxyl groups in the molecules). When there is a high content of polyphenols, the tea has a bitter flavor. Assam tea generally includes 15–21% tannins, while Chinese tea includes about 12–18%. Additionally, Assam tea includes 3–5% caffeine, while Chinese tea includes 2–4% (Fig. 4). As a result, overseas tea made from Assam tea has a strong flavor than Japanese black tea. Theanine tastes umami and sweet. Theanine is synthesized in the root and stored in the leaves. Thereafter, theanine is divided into glutamic acid and ethylamine by sunlight, and ethylamine carbon is metabolically converted to polyphenols such as tannins. This is why tea fields are located in mountainous regions where the fog is thick, and the leaves are not overexposed to sunlight, which causes the theanine to remain in the leaves. Additionally, the metabolism of theanine is influenced not only by light but also by temperature, and theanine’s metabolism is promoted as the temperature rises (Fig. 5). 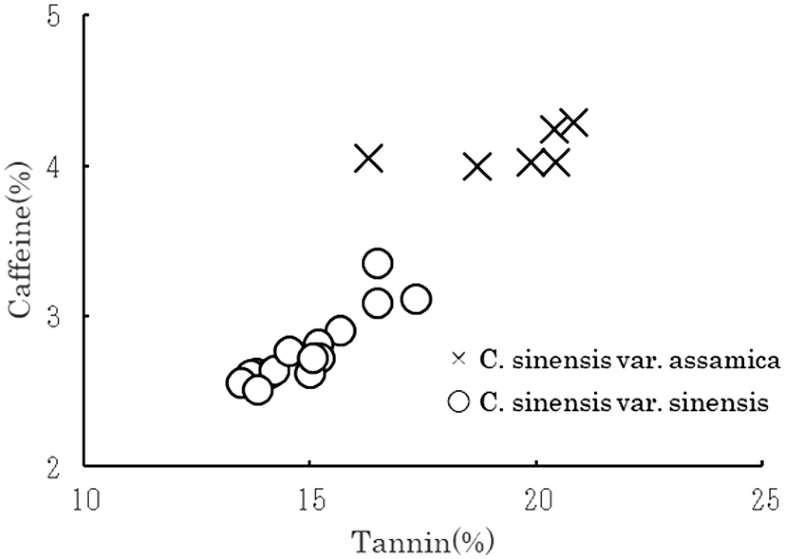 Therefore, theanine and tannin differ in content depending on when the tea is harvested (Anan and Nakagawa 1974). When producing black tea with leaves picked during the summer that contain many tannins, the content of polyphenols is higher than that of leaves picked in the spring. Therefore, it is possible to make tea with a strongly astringent flavor. Tea contains various ingredients such as tannins, and various studies have been conducted to determine their effects on the human body. Table 1 describes the ingredients of tea and their corresponding effects. The effects of tannins can be roughly classified into two types, antioxidant and adsorptive. Tannins are known to have the effect of eliminating biological radicals (Hu 2001; Zhao et al. 2001). Due to their adsorptive effects, tannins also have antibacterial properties, deodorant effects (Omori et al. 2017), etc. Tea manufacturing involves an important process for generating flavor elements. Although green tea has natural flavor elements, black tea manufacturing increases the quantity and type of flavor elements (Table 2). Compared with green tea, which only takes 3–4 h to manufacture by machine, the process for black tea takes longer. Withering alone takes roughly 15 h, and fermenting can take 2 h. Finally, black tea manufacturing takes about 20 h, and the final product is roughly one quarter of the weight of the raw leaves. As a case study, we featured green tea farmers who produce high-quality Japanese black tea in Sashima. Among 30 tea farmers in this area, eight farmers produce black tea. They have been producing green tea under the name of “Sashima-cha” for a long time. However, they needed a new market because recent years have seen the green tea market shrunk. Some tea farmers, who cultivated tea of Assam variety suitable for black tea, firstly began to produce Japanese black tea. Unlike green tea, there was very few information for the production of black tea in Japan, so the farmers sought the production technologies by themselves. To gain the knowledge about production technologies, the farmers approached a few leading researchers and farmers. Gradually, the quality of their products improved (Fig. 6). Because the black tea production was not fully automated like green tea, key techniques such as appropriate temperature and humidity in the fermenting should be adjusted based on farmers know-how. Therefore, the leading researchers and farmers accessed the research institutes and universities to collaborate with experts and visited advancing tea farmers in Sri Lanka to learn from them and refine Japanese tea production technologies. Afterward, they have instructed many Japanese black tea farmers including Sashima. They also have given opportunities to study in advanced tea production sites in China and Taiwan, resulting in sharing tacit knowledge between these farmers of both countries. A few retailers and lead consumers have an important role to play on evaluating the quality of black tea. As a distribution system, Japanese black tea is mostly carried out from farmers to retailers, which is different from the green tea supply chain using major distributors and agricultural cooperatives. Some black tea farmers and retailers use their channels to organize Japan-wide farmers markets in autumn. In addition, these black tea farmers have developed direct channels to their consumers by the Internet and their own stores. This connection with retailers and consumers provides valuable opportunities to have feedbacks on their products. We have discussed the history of Japanese black tea, the use of manufacturing technology, and the components of tea and their effects on humans. In this chapter, we focus on technological development, technology transfer and learning, and new market development. Technological development caused new market development, and technology transfer connected them. The technological development of Japanese black tea refers to progress made regarding breed improvement, manufacturing, component analysis, and the analysis of its effect on human health. Among these factors, the main reasons for the revival and spread of Japanese black tea are production and manufacturing innovation. In terms of manufacturing, various studies have focused on the development of tea manufacturing machines and other equipment in the 1950s. However, the Japanese black tea industry declined after the liberalization of foreign tea imports, and modern farmers did not have the expertise necessary for black tea manufacturing. Under such circumstances, manufacturing technology for fermentation should have been gradually established by entrepreneurial farmers who learned about various elements such as climate, varieties, and fermentation methods that differ from other countries. The production of black tea includes four processes: withering, rolling, fermenting, and drying. Particularly, fermentation is a high-skilled process. For example, if the humidity is low, the surface of the tea leaves dries because of the fermentation heat and the tea leaves retain their grassy smell. If the fermentation process is not consistent, some tea leaves will decay due to excessive fermentation. To carry out fermentation in a moderate state, it is extremely important to develop technical knowledge regarding the interaction of tea with humidity and temperature as well as the process of fermentation. As seen in the case, there were opportunities that farmers could learn modern tea production technologies from researchers and leading farmers within the country and overseas. This has had a great impact to improve the quality of Japanese black tea as a whole. When the Japanese black tea market launched, a number of new entrants increased and some of the production in the early stages was of low quality. Under such circumstances, the spread of technological knowledge by these leading farmers has improved the level of tea production as a whole, and low-quality products have gradually been eliminated. For the black tea farmers, expansion of the Japanese black tea market would be a big dream with high-quality products. According to prior studies on exploratory learning (Danneels 2007; Eisenhardt and Martin 2000; Miller et al. 2007), strategies resulting from various trial efforts are likely to be more successful than those designed based on the results of well-analyzed programs. McGrath (2001) argues that omnidirectional exploratory activities are the key to growth from radical innovation. There are two major tea markets in Japan, the imported black tea market and the Japanese green tea market. The market for Japanese black tea is intermediate and exists in between the two. The imported black tea market and the Japanese green tea market have two separate supply chains. Both have standardized harvesting technologies, and both types of tea are manufactured with a standardized high quality. Large trading companies and tea product makers import and manufacture these intermediate commodities and distribute them to retailers. The prices have a wide range, but the median price appears to be low for the respective volume. There are three forms of consumption, leaf tea, instant tea such as tea bags, and beverages sold in cans or plastic bottles. Modern lifestyles have changed the main consumption from leaf tea to beverages. As mentioned above, the quality of Japanese black tea has been rapidly improved by farmers who developed technological innovation and transferred it to others, which has also expanded the market. This expanding market needs a robust supply chain. The most significant difference in the market of Japanese black tea and that of imported black tea or Japanese green tea is the existence of an intermediary in the distribution system. Some Japanese black tea is traded by intermediaries, but mostly, farmers needed to construct a system to either sell this tea directly to small retailers and blenders or sell it by using the Internet as the sales channel. Therefore, generally, leaf tea should be sold at a higher price. One of the principal characteristics of direct selling is that the farmers have control over packing, packaging, and pricing of the tea, which increases farmers’ costs but also gives them more options for managing their enterprise. These circumstances increase the challenges of farmers and also increase the quality of tea. Another remarkable characteristic of direct selling is the open channel of communication among farmers and consumers. There is no such communication system in the Japanese green tea market. However, farmers who make Japanese black tea use the feedback from consumers as a driver for the next innovation. 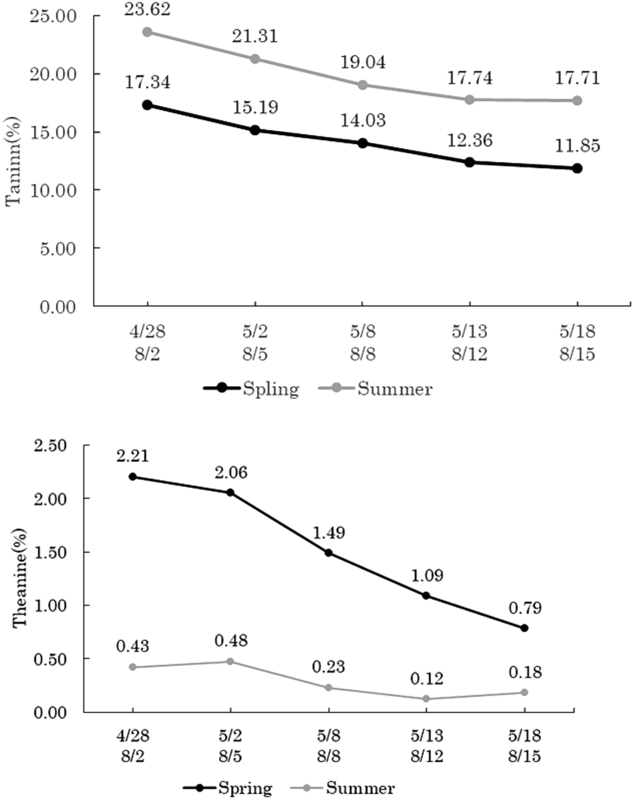 In this study, we investigated the development process of the Japanese black tea market. Some entrepreneurial green tea farmers explored the Japanese black tea market in addition to their green tea production. O’Connor and Rice (2013) argue that economic opportunities can be found through communications with customers and suppliers as well as business partners and group members. The business opportunities for the Japanese black tea were also found through the existing business providing connections with other green tea farmers, retailers, and consumers. Through these communications, they found that the innovating fermentation process established by leading farmers and researchers was a key to the new market development of Japanese black tea, and started transferring the fermentation technologies to the other black tea farmers. One of the key factors for success here is that the Japanese black tea farmers accomplished the technological development and its transfer at the same time. Most of the green tea farms in Japan are managed by individuals. Therefore, the new black tea products might not lead to the market expansion immediately, or they could have even lost the business opportunities before the market was formed. The Japanese black tea farmers, however, transferred their core technologies immediately and increased the number of reliable producers. Consequently, they succeeded in the expansion of the Japanese black tea market earlier. On the other hand, a new market creation could cause cannibalization of existing business, and the Japanese black tea market was no exception. If they sold their black tea in the existing green tea market, they could have easily faced the cannibalization among the green tea and the black tea. Therefore, they developed their own channels for the Japanese black tea as shown on the right side of Fig. 6. In particular, the superior point in the case of Sashima was that they created a feedback system with consumers to improve the quality of their products. It was a new challenge for the farmers and had a positive impact on the market creation of the Japanese black tea. As O’Reilly and Tushman (2004) indicate that it is important to keep a balance between existing and new business, our result is consistent with the previous study. RT analyzed characteristic of Japanese black tea and organized its birth, prosperity, decline, and the history of the Japanese black tea industry under the supervision of DK. DK was a major contributor in writing the manuscript. Both authors read and approved the final manuscript. This work was supported by JSPS Grants-in-Aid for Scientific Research (KAKENHI) Grant Number 16K03894.